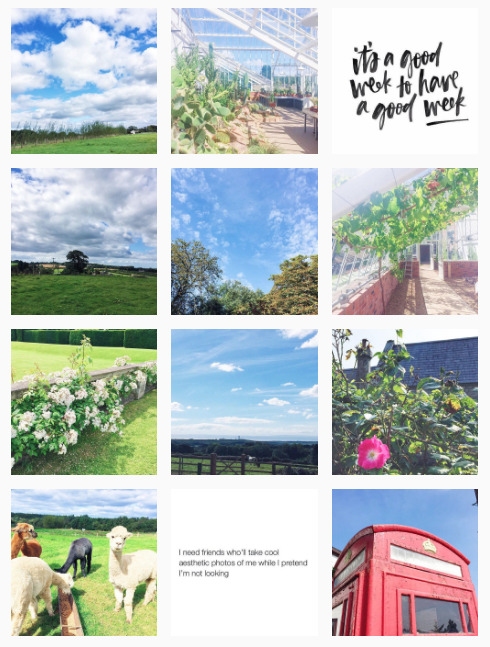 Remember when I wrote this post about how I wouldn't have an Instagram theme? Yeah that lasted all of 3 months. I hold my hands up and admit, as lovely as my intentions were, I am an Instagram theme convert. 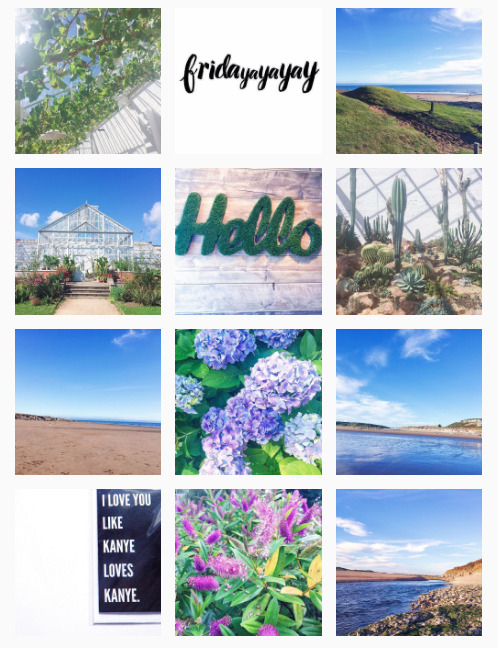 It was an #IGChat sometime in August we were discussing themes and I had a right good chinwag with some of the girls who had Instagram themes and Instagram schedules and after hearing what a success they'd found it I decided to trial it for a week and just see. I haven't stopped since then. When I say theme I mean it in the very loosest of terms. What I didn't like about the idea originally was constricting what I was posting. I pride myself on the variety of my content both on the blog and on my social media profiles and I didn't want to limit myself to flatlays or nature or all white or pink. As much as I like feeds like this to look at, I just didn't want to limit myself. Until someone mentioned 'editing themes' and the lightbulb went off in my head. Suddenly I had the opportunity to have a 'theme' that people could recognise without compromising on my content and what I could post. I only wanted to trial it for a week to see what the outcome would be and the affect it'd have on my following and my engagement and it just so happened it was right after #BloggerPitP so my grid was uhm, on quite the high anyway. I also tested the waters with a posting schedule which had been mentioned in the chat as something worth while at the same time and boy oh boy has it all made a difference. I decided to make a proper effort with my Instagram and it's paid off. My followers are steadily rising (one day I might make it to the illusive 1K) but my likes per post are upped about 25% if not more each day and my engagement is so much better. Obvs you still get the spam and obvs you get the accounts that follow you then delete you the next day but on the whole, it's made a significant difference. 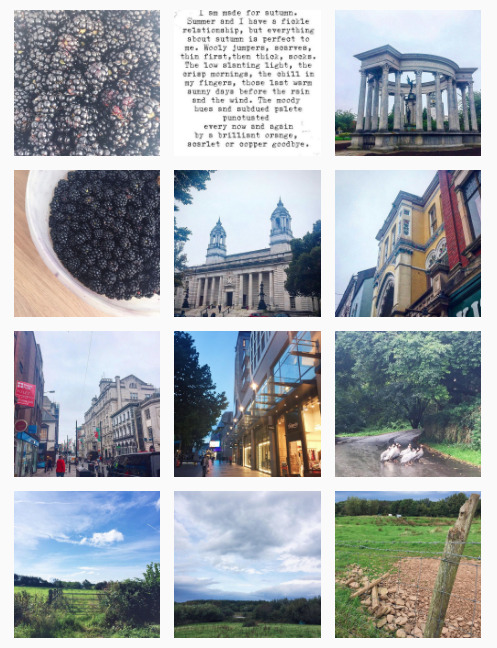 The photos in this post are a selection of my Instagram feed over the past 6 or 7 weeks and as you can see it varies a lot. There's times when it's very green, times when it's very blue, times when it's bright and vibrant, times when it's very nature orientated....the content changes but the editing stays the same. I've been tagged in a few chats lately of people saying they like my Instagram or that my feed is one they recognise and it means SO much because, as boring as it is to say, I really have been trying. I started with a single photo from the bloggers picnic and edited the brightness and contrast and temperature on my VSCO app and haven't changed anything since. I simply upload my photos to the app and copy and paste the edits from that single photo to all my new images. Following that I upload my edits into the UNUM app (lifesaver) and that's where I rejig them, shuffle them and move them about to create the nicest looking grid possible. Sometimes I leave the photos in chronological order, sometimes I move them about if it's all a bit samey or a lot of similar angles one after the other and then I upload straight from there. Like my loose editing theme I also have a loose schedule consisting of a post in the morning around 7.00am-9.00am to catch people at breakfast or on the morning commute, another at around 5.00pm-6.00pm for people coming the opposite way and then another later at night when people are absentmindedly scrolling in bed (somewhere around 10pm-12am). Like I said it's a loose schedule and if I don't have time to post one or I'm busy (or asleep) when I'd normally upload I simply don't catch up and that's a ok with me. One thing I have noticed is the amount of time I upload a day doesn't make a difference. People say you should post at least once a day to keep on top of the awful algorithm but me and my blogging whatsapp gals have discussed it and me and Effi both post around 3 times a day with relatively the same success. You might think it's spamming but I have yet to loose a lot of followers for it so you do what suits you boo. As well as an editing theme and a posting schedule I've made a conscious effort with hashtags which I copy and paste from my notes on my phone and the effort I've put in has done the world of good. I feel happy and confident about my Instagram feed and I've got lots of lovely things scheduled to post and I'm loving where it's going. I've also had a huge cull on my grid this morning of my following so now my feed is full of people who's content I appreciate and want to engage with, content I relate to or aspire to and themes I'm in love with. And one thing I noticed was how many feeds with themes I was following and how many without themes I was unfollowing. It's nothing personal, it's just a preference and I have fully committed to the theme life. Soz not soz. Feb 23 The Problem With An Instagram Theme. Apr 20 Why I Changed Back To A Personal Instagram Account. Feb 12 What I Learnt About Instagram & How YOU Can Implement It Into Your Own Feed.